​How do I vote for the candidates? 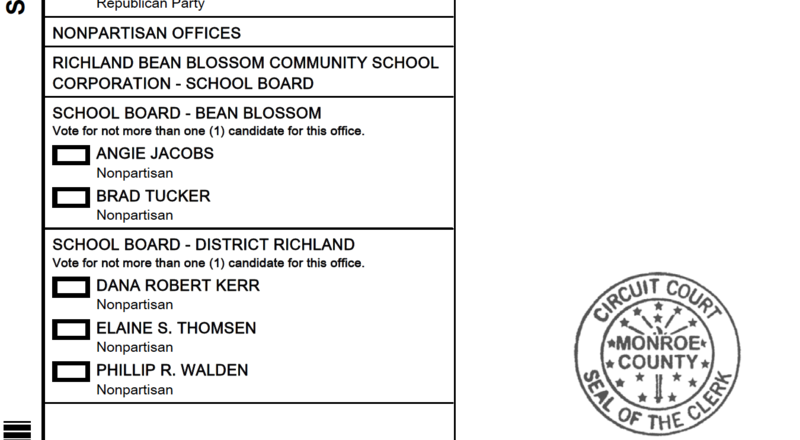 The RBBCSC school board race is nonpartisan. Although the candidates represent specific districts, they are "at large" which means you can vote in both districts. State data on the school corporation can be found here. The forum took place on Monday, October 1, 2018, at Edgewood High School Auditorium. ​"Keys to the Candidates: School Board Races," Herald Times, October 5, 2018. We sent out a questionnaire to every candidate. And every candidate responded. What are the biggest challenges facing the Richland Bean Blossom Community School Corporation? What are your ideas for how best to involve and communicate with RBB community members, faculty and staff about the school board’s decision-making process? What is the role of extracurricular activities in RBBCSC? Currently, my connection to public schools are my children who both are enrolled in RBBCSC. During their years of attendance, I have actively participated in their school life by volunteering, chaperoning, supporting classroom activities and serving on parent committees. Being a graduate of RBBCSC, having attended K-12 I am interested in the success of this corporation. I have increasingly become interested in the goals and business of our school system. The role of the school board is to make the best possible education available to all students in the school district. The board must work to provide financial stability, quality administrators, teachers and support staff. The school board must acknowledge the community’s values, beliefs, and priorities when making decisions for the school system. After graduation from Edgewood High School I began working at IU Health Bloomington Hospital as a nurse technologist. Through this experience I decided to advance my career by returning to school and received my nursing degree. Over the course of the last 20 years, I have worked in the Intensive Care Unit and currently work as a Clinical Advisor in the Post Anesthesia Care Unit. In this position I educate and monitor 20 staff members. I am required to give input while policies are being developed, write standards of work, and make sure hospital and state mandated policies are followed by staff members. In this position we are constantly collaborating with team members to achieve goals. Through my profession I possess many qualities that would greatly benefit my work on the school board. Of those important qualities: organization, goal oriented, ability to make difficult decisions if necessary, receptive to input from others, ability to solve problems, work through and achieve solutions. The goal of a public education system is to provide a quality education for all children.This is acquired by developing programs to promote responsibility, critical thinking, communication, creativity and collaboration within the student. 5. What are the biggest challenges facing the Richland Bean Blossom Community School Corporation? ​At the present time we are entering a transition period with hiring a new superintendent. The corporation is beginning new construction and upgrades to existing facilities through bond issues. At the same time the corporation is experiencing a loss of student enrollment which impacts the financial condition of the corporation. 6. What are your biggest budget priorities? Student education and safety are the number one priorities. The faculty and staff members would be next. The goal is to balance the budget as much as possible but if there is a problem we must find ways to cut in other areas. If finances must be cut, children, safety, faculty and staff must be held as top priority. 7. What are your ideas for how best to involve and communicate with RBB community members, faculty and staff about the school board’s decisions-making process? To best involve the community, faculty and staff their input needs to start at the planning stage. They would be given the opportunity to examine and submit suggestions. The school board would use their input to guide them for final decisions. For example, the building of a new school, faculty and staff members should be allowed input of how best to accommodate their needs. 8. How can the school board support teachers? The school board can best support teachers by insisting on quality administrators who encourage their staff through example, advice, opportunities and respect. 9. What is the role of extracurricular activities in RBBCSC? The role of extracurricular activities is to provide additional experiences for students beyond the classroom. Through these activities students develop the ability to set and attain goals, strategize through teamwork, and practice valuable life skills. Education must be the priority then comes extracurricular activities. 10. Describe your position on public funding for charters schools and vouchers programs. My position on public funding for charter schools and vouchers is that I do not believe that state funding should be allowed to support private organizations. I support that people have the right to choose as to where their child is educated however, I believe they should have to pay for private education themselves, if they so desire. Without state funding, public schools programs will fail because they will not be able to educate in favor of every student to reach his/her full potential. As funds follow children to private schools, public school programs will be negatively affected. School Connection: I retired from public school education in 2006. I was a business teacher and basketball coach for 10 years at Madison High School and South Knox Jr/Sr High School. The next 4 years, I served as Assistant Principal at Princeton Community High School and my final 7 years were as Principal at Edgewood High School. I received my B.S., M.S in Business Education from Indiana State along with my Education Administration licensure. My wife, Stacy, and I moved to RBBCSC in 1999 when our son, Brady, was 5. Upon my retirement from education, I took over a State Farm Insurance agency in Greencastle where I continue to work. ​School Board role is policy making, oversight group for the school corporation. Effective school boards commit to high expectations for student learning while providing resources needed to work with all students. The school board has the responsibility to hire strong administrative leaders to handle the daily operational needs of school system. The key is to provide support without the proverbial “micro-management” tag. My skill set includes my tenure in the public school setting as a teacher, coach, administrator. I grew up in the school system and have enjoyed many hats while growing in my professional life. I am also a parent, taxpayer and business owner. My experiences will provide a strong opportunity to work within the vision of the school corporation. I have managed large groups of teachers in the school setting while maintaining building level budget. My most recent experience in the insurance, financial services industry will provide insight to personnel matters. I am a lifetime learner and would enjoy the professional development opportunities provided to school board members within the state. It is a board members responsibility to stay current with educational trends while providing opportunities for student success. Public education goals are numerous. Primarily, I feel schools should provide opportunities to help students grow as a person by promoting career education/preparation, active civic participation, and the opportunity to lead a full life. The ability to utilize your education and school experiences should provide opportunities to open many doors throughout life while becoming a caring, giving, and productive member of society. Challenges are ongoing for all school corporations within the state. As a board member, it is imperative to listen and gain an understanding of challenges that our corporation faces as we prepare for the future. Healing the school corporation with the consolidation of building resources while maintaining instructional excellence is ongoing goal. School enrollment which has been challenged by recent charter school legislation has promoted school competition for student population. 6. What are your budget priorities? Budget responsibility is to adopt and oversee the annual school budget. The board should provide support to the superintendent and administrative team while providing oversight to the budget. 7. What are your ideas for how best to involve and communicate with RBB community members, faculty and staff about the school board’s decision-making process? Communication with community, faculty, and staff is important. School board needs to provide support to the personnel hired to manage the central office and at the building levels. Open lines of communication between all stakeholders should be promoted. Transparency is important in communicating to the public. Board members should listen to community input and take the time to become well informed while coordinating communications with administrative personnel. The board can provide support for teachers by providing resources necessary to help in the learning environment. The corporation needs to take the time to hire the best school personnel available and then give them the resources necessary to educate our students. Every person had a teacher that made a “difference” in their life. I am advocate for teachers that make a difference every day with their talents and love for student learning. Extra-curricular activities are an extension of the school day. I always encouraged students to get involved in some type of extra-curricular activity. I truly believe that students and families involved in extra-curricular activities strengthen their school experience. ​10. Describe your position on public funding for charters and voucher schools. The State of Indiana provides educational options with the voucher/school choice system. I understand the concept that students may learn better in different types of school environments. Indiana provides many types of educational opportunities in the K-12 setting. I am a proponent of public school funding to be utilized to help expand and grow public schools. Public schools need to continue to adjust to meet the changing needs of today’s learners and provide similar resources to what private schools may offer within the public school setting. I would like to see more collaboration with charter schools and the public schools in order to utilize resources that taxpayers are funding to help prepare our future generations. My own education was in the public school system and my children’s as well. My involvement as a parent began when my oldest child started kindergarten at the Edgewood Early Childhood Center, in 1997. Working with the principal, we started the EECC PTO and I was the first president. I stayed involved in the PTO in various capacities. In 2003, my oldest child started at Edgewood Junior High School and the principal came to me and asked if I would help revitalize the PTO as it had dwindled over the years to just a few people. I became the president of the PTO and organized the parents and the PTO grew significantly in membership and in activities to support EJHS. In 2004, my oldest child became a member of Mini Warehouse, the EJHS show choir. That began my fourteen year service on the dads crew, most of those years as the head dad, which entailed going between the EJHS and EHS dads crews. All three of my children have participated in show choir, my youngest being a senior this year in Music Warehouse and Sophisticated Ladies. In 2006, several people approached me and encouraged me to run for the RBBCSC School Board. After discussions with my family and prayer, I accepted the challenge and was elected. I have served on the Board for twelve years. In addition, I have been an adjunct instructor at Ivy Tech from the last eight years, usually teaching three to four classes a semester. In summary, I have directly served the public school system, and RBBCSC specifically, continuously and in multiple ways for the last twenty-one years. The school board is the governing body of the school corporation. The board has legislative authority with regards to bylaws and policies. The board adopts curriculum, budgets, bargaining agreements, and contracts. The board has executive authority in that it hires the superintendent. The board is responsible for the corporation’s facilities in their planning and maintenance. It is just as important to know what the board’s role does not include. The school board is not an administrator and does not involve itself with the day-to-day operations of the central office or schools. While the board sets policies and direction, it is for the superintendent and other administrators to run the corporation. I believe that my skill set will serve the corporation well, and has for the last twelve years. My training and experience as an attorney has provided me with analytical skills, research skills, perseverance, and creativity when it comes to problem solving. I am able to use sound judgment, even when the decision that has to be made goes against my own desires and is not popular with some. During my twelve years of service on the school board, I have had to work with the other board members on numerous difficult issues. For example, when the state cut our funding during the recent recession, the superintendent at the time wanted to eliminate fourteen teacher positions or close Stinesville Elementary School. These were the only options presented to the board. I personally went through the budget and investigated other options and found ways to keep Stinesville open and to save the majority of the teachers’ jobs to the benefit of our students. Another example would be when the Monroe County Redevelopment Commission (RDC) was looking to extend the life of the Westside Tax Increment Financing (TIF) District. This district includes the majority of the industrial and commercial properties in our school district. If the TIF district were to end, property taxes would have gone down as the TIF district would not be capturing those tax dollars and they would be spread amongst the underlying authorities. While the effort to stop the extension of the TIF district was not successful, the Monroe County Council, Commissioners, and Plan Commission stated that the RDC needed to help the schools in some way. That is when we requested, and received, the STEM (science, technology, engineering and math) grant which brings up to $270,000 to RBBCSC every year for six years (Over $1,500,000). This grant was the impetus to start STEM as a corporation-wide curriculum initiative. We have even added the arts to make it STEAM. The goal of the public education system is to provide each and every child with a quality education regardless of their background or station in life. At RBBCSC, we accomplish this goal be adhering to our vision of “Living, Learning and Leading Together”. “Our mission is to work in cooperation with the community and families to provide students with an education that promotes responsible citizenship, develops critical thinking, communication, collaboration and creativity.” My goal for RBBCSC is to provide each and every student what they need to be successful, whether they are college bound, entering the workforce, or serving our country. Not only academically, but also by helping them to be contributing citizens to society. RBBCSC is facing two significant challenges at this time. The first is that the entire RBB community needs to heal from the loss of Stinesville Elementary School. The closure hurt many people deeply, including current students, alumni, and community members. I am hopeful that we can all come together and put that passion to work in supporting our students and schools so that we can continue to meet our ever-rising aspirations. Secondly, we are facing some financial issues due to the loss of 136 students from last year. 50 of those being kindergarten students. Creativity is essential in dealing with the funding loss on both sides, revenues and expenditures. With open enrollment, families have numerous choices, therefore we need to show them why RBBCSC is the best choice they can make so that their children can be the best that they can be. Increased students leads to increase revenues. But, in these lean times, there needs to be creativity in our spending, allowing us to maximize the full value of every dollar. This will be a difficult task as current school funding is insufficient to say the least. I hope my experience in dealing with budget reductions in the past will help ease the burden, as well as the impact on the classroom. As stated above, I believe that RBBCSC should put considerable effort into promoting our schools and attracting new students. This will increase revenues as we receive funding based on our student count. I believe this includes building a pre-kindergarten / kindergarten facility where parents will know that their child is receiving excellent instruction and care in a quality and welcoming facility. In addition, I would like to increase our cash balance, which would enable us to be better prepared to meet future uncertainties as they may arise. Finally, the new funding strategy will bring with it more flexibility, so we must be cognizant of our long-term needs and not only focus on the short run. RBBCSC has always been a central part of our community. There is constant interaction with the community. Our involvement in the Monroe County Fall Festival being a recent example. I do believe however, that the community has been less involved with the school board than I had hoped. There have been several more community members present at school board meetings lately than there have been in the past, which is a wonderful step. I do, however, realize that the world moves at such a fast pace today and that people have many commitments. This makes it difficult for them to fit in school board meetings if there is not an item of specific interest on the agenda. That is why we reached out to the community during the long range planning process to make sure we had community input. In addition, I believe that RBBCSC should update our website and continually strive to make it user friendly. Of course, that takes time and our staff already works very hard, so we will have to be inventive to accomplish this. Every decision that the school board makes should be based on what is best for our students. Providing the teachers with the tools to provide quality instruction is a key component. We support the teachers financially through salaries and benefits and we strive to do the best we can, but we are constrained by funding. We support teachers by giving them opportunities for professional development. We support teachers by giving them tools in the classroom, such as technology. We support teachers by providing facilities that are conducive to instruction. Just as importantly, we can support teachers by word and action, so that they are aware of the fact that they are greatly appreciated and how we support them. Extracurricular activities are an integral part of educating our children as they provide opportunities to develop many life skills. Those students who participate in extracurricular activities perform better academically. So many of today’s occupations involve working in a team environment, and ECAs have a strong social component where students learn and hone their skills in interpersonal relationships. Likewise, to team and social skills, ECAs promote higher self-esteem, thus providing opportunities for students to explore a wide range of interests. In addition, for college-bound students and those entering the workforce or service, participation in ECAs are very helpful for resumes and applications. ECAs are extremely important and are very limited in charter schools, if they have them at all. RBBCSC have many ECAs for students to be involved in, all-encompassing many interests. My many years of service to public schools demonstrates my heartfelt commitment to their advancement. I believe that public funds should only be distributed to public schools. Charters and voucher schools do not have the same accountability that is required of public schools. Public schools are open to all, while private schools can choose which students they accept. Public dollars should go to only public schools. Charters and voucher schools are taking money from the public schools which causes serious financial strain. I find it interesting that the State of Indiana wants to have smaller corporations merge with larger ones, but they encourage small private schools. I wish that the State would fund public schools appropriately, enabling us to focus even more attention on instruction, and not on how we will cope with dwindling funds due to monies going to private groups. ​I have no connections, just concerns on how and why things are done the way there done. To be open and transparent with the public on their decisions. I believe they should be active in school functions and aware of what is happening in the schools. Be informed on state legislation going on and what is being tried in other schools. This list could go on forever. I own a commercial cleaning company that has taught me many things in the business world, like budgeting and staying in your budget. Making things work when you think they won’t and willing to try new ideas. ​Many things, but most all give them the best possible education, guidance, protection, and compassion. Honesty and open dialog with parents on their decisions and getting their trust back with the board. To stay within the budget, read it and ask questions if I don’t understand something. I have a great interest in this matter, when looking at the budget, you really can’t tell what goes where and what really is in each category. I do a budget every year personally and for my business and you can’t just lump things all together, it needs to be broken down more. A monthly email could be informative to all the parents on what is being considered and ask for feed back from them, as well as the staff and faculty. Maybe, if the parents could meet and have one or two individuals emails the board their concerns before the board votes on matters. There must be more communication between the board and the parents. If I am elected, I would be happy to put this in operation and keep all the parents informed. Again, more communication with each other. Sit in on their classes and experience what is happening in the class room. Emails between them to keep everyone informed. It helps to keep everyone informed on what, when, how and why. I really do not know what they do now, but I would think there would be some participation on the boards part. I was brought up through the public school system and graduated from RBBCSC. I also have several family members that currently attend RBBCSC. I believe the school board or the board of trustees is completely responsible as they hire the person in charge of the school, vote to take resignations and also inact the budget for the school corporation. I believe the biggest asset that I will bring to this board is a fresh set of eyes. This board has been on there a long time and they have not released documents or keep anything up to date for the public. I believe the goal of the public education system is to find a happy medium so that all children can learn at their own levels. The board can not do this with out the support of great group of educators. Bringing back trust, transparency and quality education to the students and the public. As well as a budget that is balanced correctly and focuses on education for the children. This question is a hard question to answer because the current board has not provided documentation of an actual and true budget to the public for almost two years. I believe the biggest priority is to go in, look at the budget and start gutting what is not needed than present that to the public. I believe an open forum and actually answering the questions of the public, faculty and staff is important, no there is not always time for several questions per person, but I believe by giving the public time to speak and actually giving them information they are asking about is important. This board has not done that and currently questions are not being answered. I believe a board and superintendent can support teachers by asking them questions, bringing them in and seeing what is actually going on. Teachers are the main point that will see each student daily, we should know from them what they need to succeed. RBBCSC has a large range of extracurricular activities. I think we need to look at the large picture and see what is best for the student. Are they helping the student excel? If the answer is yes and the budget is appropriate for that activity. ​This is another tough subject, unfortunately the school board has no power over this subject as it's at a state level. With that being said I don't agree with money going to a charter school or private school that should go to a public school, but this has apparently proven as enrollment has dropped at many public schools that there are issues. Why are parents pulling their kids from public schools and putting in charter or private schools? Also why are parents pulling kids from one public school to another? For that answer we have to look and see what the private, charter and other schools are offering vs this school.